According to our Lax-ELO model, Duke is the only away team favored in the first round of the NCAA Men’s lacrosse tournament. Based on Lax-ELO they have a 64% chance of defeating Johns Hopkins and advancing to the second round. But this is not an article about seeding. We want to use this space to talk about the statistical trends that these teams bring into the game. While stats and trends are only part of the story, they are helpful going into a game so that you know what to watch for. Duke comes into this game as the #8 ranked defense in the nation. Hopkins enters as the #7 most efficient offense. In this respect, they enter on a fairly level playing field. Johns Hopkins has had two other games against top defenses in Rutgers and Loyola. These games were early in the season, and teams have evolved since then, but in these two matchups, they scored on 36% of their possessions. So it’s not as if they’ve turned to mush against top defenses. Those were also their first two wins of the season. One place where the Blue Jays have an opportunity to crack the defense of the Blue Devils is in shorter possessions. 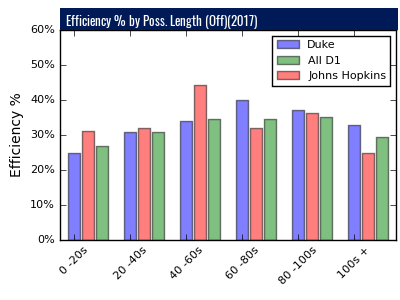 As you can see below, in the games that Duke has lost, their defense has allowed much higher scoring rates in quick possessions (i.e. less than 20 seconds). We’ve written in the past about the fact that Johns Hopkins doesn’t always take advantage of their quick-offense skill set. If the Jays decide to step on the gas pedal a bit, they may be able to rack up some goals in quick, unsettled situations. 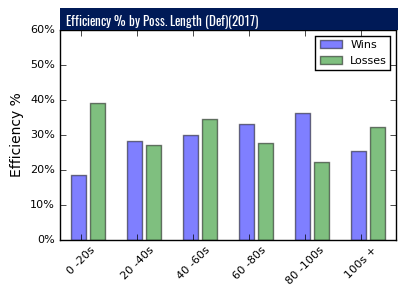 Duke loses when teams are efficient early in the clock; they’ve weather late-clock efficiency and still won. And this could be critical because the Hopkins defense is simply not good enough to make up for an off-day on the the offensive side of the ledger. In their 8 wins, the offense has clicked at a 39% clip. In their 6 losses, that figure is 25%. More importantly, the chart below shows that they are 0-5 when the offense doesn’t score on more than 30% of their possessions. Duke has only allowed 3 opponents to hit this mark (Denver, Syracuse, and Air Force) and their season average is 23.3%. 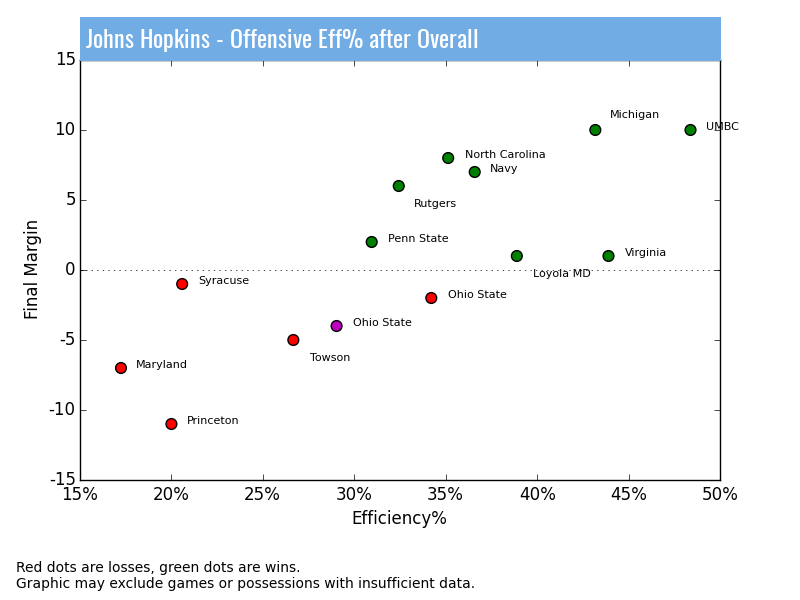 Many teams show a pretty strong relationship between offensive efficiency and final margin (hard to win if you can’t score), but Hopkins has an especially strong relationship (correlation is .78). But there are counter-examples, even within the tournament field. Notre Dame is one, with hardly any relationship between offensive efficiency and winning (correlation is .32). So we’ll continue our call to take the reins of this Blue Jays offense. And what better situation? If you play conservative, take your time, and wait until 60+ seconds have run off, you might be successful. But Duke has still been able to win those games. Plus, as you’ll see next, conservative, break-even offense leaves your defense to deal with a strong Duke offense. Why not press the advantage you have early in the clock and make this game into one played on terms dictated by the Hopkins offense? Duke comes into this game as the #7 ranked offense in the nation. Hopkins enters as the 57th best defense in D1. In other words, not a level playing field. Side note: Duke is one of three teams in the top 10 in both offense and defensive efficiency. Loyola and Maryland are the other two. How was Duke almost left out of this tournament? 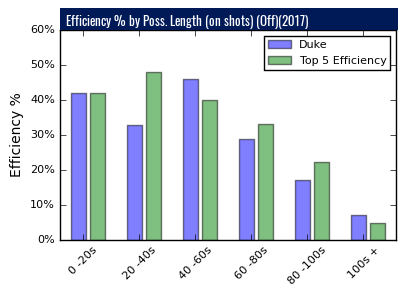 If you compare Duke against the top 5 efficiency teams in the country, they are overall just a notch below in most offensive categories. To be expected since they are just outside the top 5 in offensive efficiency. But a deeper dive into the numbers shows where they really excel. 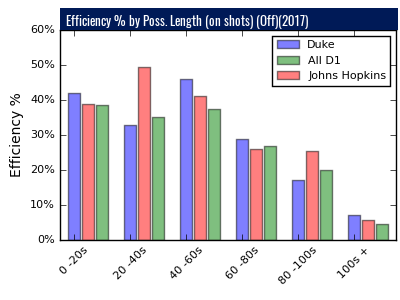 The chart below shows how Duke compares to the top teams in D1 depending on when they took the first shot of a possession. (This is different than the length of a possession, which can include many shots. This chart cares when the first shot was taken because that’s a better proxy for aggressiveness or pace.) As you can see, Duke excels in possessions where they attack within 20 seconds or between 40 and 60 seconds. The average top team peaks in the 20 to 40 second bucket, where a shot is not so rushed as to be reckless, but before the defense is set. Duke flips that a bit. No way to say from this data why this is happening, but something about the Duke offense allows them to have success even when they wait longer to attack than would be advisable for a generic top offense. But if you split out Duke’s wins vs their losses (as in the chart below), there are some fault lines that appear. In games Duke has won, they score on 43% of their possessions where they shoot within 20 seconds of gaining the ball. In losses, it’s 30%. Same goes for possessions where the first shot comes between 40 and 60 seconds in. Think of these as the danger zones for the Hopkins offense. 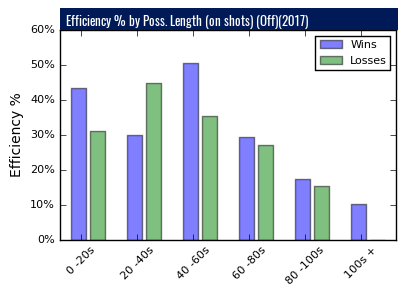 Typically, across the sample of the 2017 season, if Duke sees a shot that it likes during these two time chunks, those shots are much more likely to result in goals. The drop off between their two hot periods and the rest of the chart is pretty stunning. 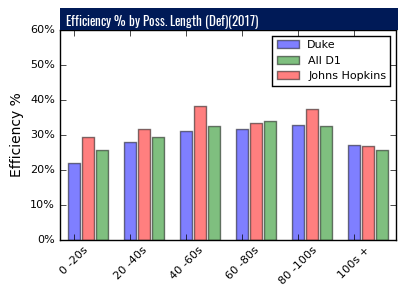 The curious thing is that in losses, the trend in Duke’s efficiency chart looks a lot like the top 5 efficiency teams in the chart above, albeit with efficiency numbers that are about 10% less across the board. So when Duke loses, they play a more traditional style, just slightly worse than everyone else. When they win, they are scoring in the “danger zone” time chunks. Again, I haven’t watched enough Duke to say why these trends are what they are. The best we can do is point out the trend. 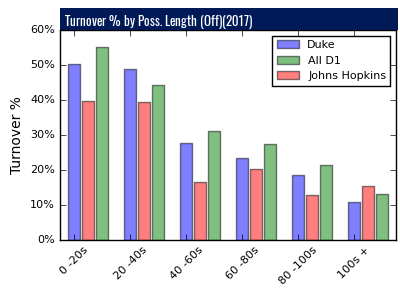 But if there is something that Hopkins can do to force Duke into a game where they play like a more traditional offense, they will radically increase their chances of winning. 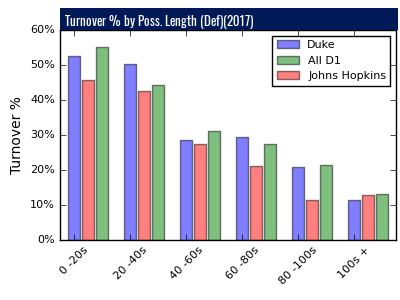 I’ve created a series of charts that plot Duke against the average D1 team on a range of turnover/efficiency metrics so that you can see how the two teams stack up.